Distribution and habitat: Phyllostachys aurea is a running type of bamboo native to China which was introduced in Taiwan and in Japan long ago. These cold hardy bamboo was naturalised in Indonesia, New Zealand, southern USA, Australia and Hawaii. Description: Phyllostachys aurea are easily identified by their characteristic compressed internodes in the lower part of the canes which have a tortoiseshell-like appearance. This internodal compression result in shorter heights and thicker cane diameters (relative to height) than many other Phyllostachys species. The canes are typically green, but will turn yellow in full or partial sun, and deepen into a gold-orange colour as the plant matures. Branching and foliage tend to start lower to the ground than many other Phyllostachys, but some prefer to cut off lower branches to show off the interesting ‘tortoise shell’ lower part of the canes. The leaves are clustered and produced on short shoots which grow from the joints on the branches. They consist of a leaf sheath 25-35mm long, which surrounds the stem and a spreading leaf blade. The base of the leaf blade is very narrow and stalk-like in appearance. Leaf sheaths are mostly hairless, except near their margins and where the sheath meets the leaf blade there is a tiny membranous structure about 1mm long topped with long hairs. On either side of this structure there are sometimes also 1-3 larger bristles. The leaf blades, 5-15cm (2-6 inch) long and 5-22mm wide are elongated in shape, may be either hairless or softly hairy and have rough but entire margins. Flowers and seeds are very rarely produced, if ever. When produced, flowers occur in spikelets up to 5cm (2 inch) long with 8 to 12 flowers. Most reports indicate that Phyllostachys aurea produces masses of flowers sporadically and synchronously, but reported intervals between mass flowering events range from 7 to 30 years. When they do come into flower most of the plants energies are directed into producing seed and consequently the plant is severely weakened. They sometimes die after flowering, but if left alone they will usually recover though they will look very poorly for a few years. Phyllostachys aurea is a long-lived bamboo with upright stems usually growing 2-8m (6-26 feet) tall, but occasionally reaching up to 12m (40 feet) in height. Plants form dense or loose clumps and spread rapidly via creeping underground stems, with the upright stems being produced from their joints. They will grow in large thickets or groves if left alone. Gardening: Phyllostachys aurea is cultivated as an ornamental plant for gardens. It is the most commonly cultivated bamboo in the United States. 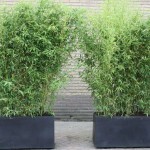 Growing rigidly upright, this bamboo is one of the best for hedges and for planting next to driveways and walkways. 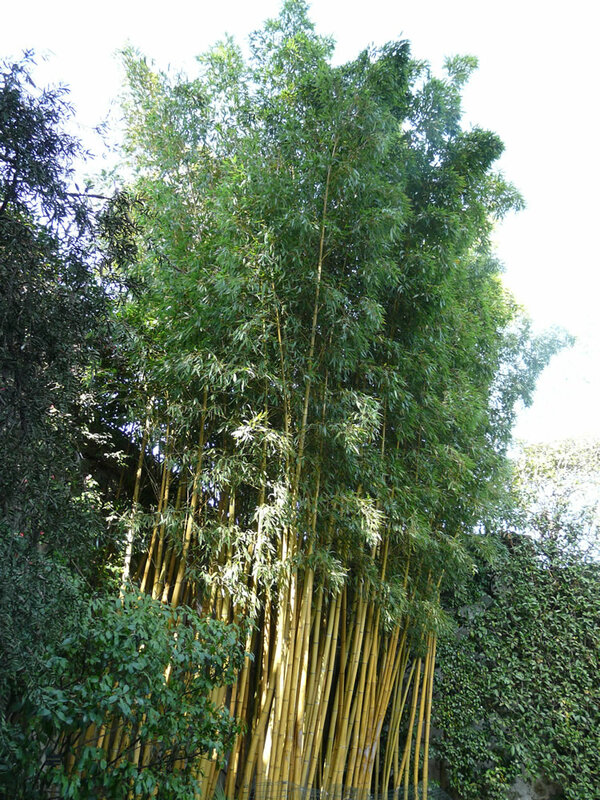 Phyllostachys aurea can be an aggressive spreader in hot climates, where care must be used in its placement. It is a fast grower in warm climate zones, but less aggressive in colder climates. Provides a thick impenetrable grove when untrimmed. In some micro climates of zone 6, this species does not remain evergreen. This beautiful bamboo will drop foliage when temps drop to around 15°C bellow 0 (5°F). Canes will most likely be killed when temps drop to 20°C below 0 (-5°F). Unless temps drop to 34°C bellow 0 (-30°F) the root system of established well mulched groves will put up new canes each spring. But, these plants will need a frost-free period of at least 26 weeks to survive. Of course, growth rate depends a lot on soil, climate, food and water. Small plants are slow to get going, so starting off with a bigger plant will grow much faster. 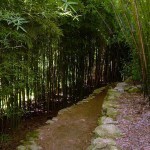 Location: Phyllostachys aurea will grow in sparsely wooded secondary forests and does best in full sun or part shade. It is best to protect these plants from cold drying winds. Soil: Phyllostachys aurea growth is considered best in rich, deep, well-drained sands or in moist, deep loams with a pH between 5 and 7,5. These plants need a soil depth of at least 36cm (14 inch) for good growth. Although, it may persist on a variety of soils, stem diameter and height are likely reduced in fine textured and/or poorly drained soils. These plants should be planted where they can be monitored and contained. The use of barriers, sunk to a depth of 60cm (24 inch) may contain their spread. 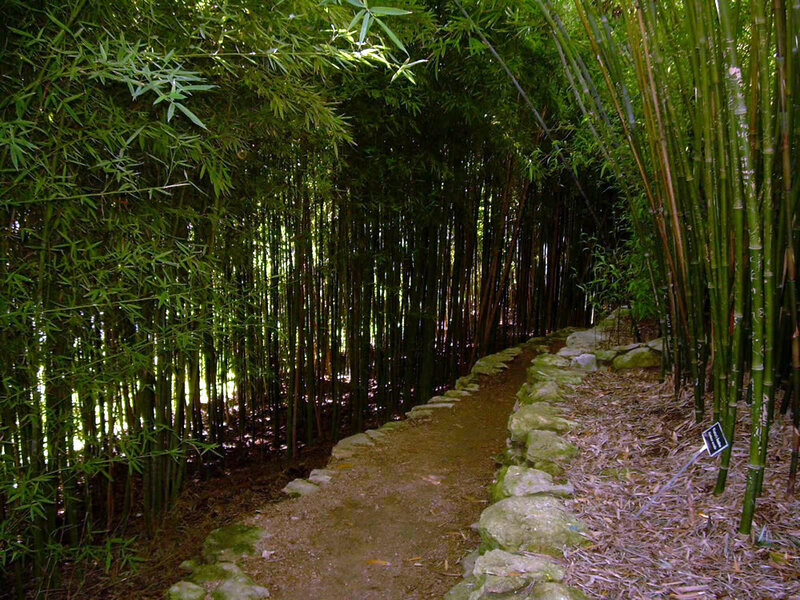 Irrigation: Give to this bamboo species plenty of water in warmer months. These plants will be less likely to suffer from overwatering. Phyllostachys aurea prefers moist soil and established plants can tolerate drought. Fertilising: Fertilise Phyllostachys aurea in spring with decayed animal manure. Container plants: Phyllostachys aurea can be grown in containers. When grown in containers these plants will not exceed 2m (6 feet) in height. The containers should be at least 30cm (12 inch) diameter and filled with good moisture retaining compost based on peat, leaf mould and charcoal. They need to be kept well watered. Spray the foliage when grown indoors. Fertilise monthly with liquid fertiliser if used in a container. Propagation: Phyllostachys aurea by division in spring as new growth commences. Divisions from the open ground do not transplant well, so will need careful treatment and nurturing under cover in pots until at least late spring. Division is best carried out in wet weather and small divisions will establish better than large clumps. Alternatively, take large divisions from established clumps and transfer them straight to their permanent positions, misting or drenching them frequently until they are established. Also, Phyllostachys aurea can be propagated by basal cane cuttings in spring. Plant pieces of runners in early spring, just as new shoots are bursting into life. Keep them continuously moist and these soon root in the pot and continue growing. Problems: Bamboo is a strong and resilient plant and is more likely to die from lack or too much water. The most common pests are most likely biological and come in forms of insects such as aphids, scales, mealybugs and mites. Treatment: Use adequate pesticide to combat these insects. It is essential that the pesticide to be applied to both leaf surfaces. When chemical application is not feasible, infested plants can be cut down and infested debris destroyed to avoid reinfestation. Note: In sub-tropical and warmer temperate regions, Phyllostachys aurea is problematic in untended areas, near gardens, along roadsides and waterways and in urban bushland. Rhizome growth by these bamboo clones can result in the development of dense thickets and colonies. A single Phyllostachys aurea clump can produce up to 15 km (9.3 miles) of stems in its lifetime. This bamboo once established, is very aggressive in both its rate of growth as well as the sprouting of new stems. Spread is often rapid in all directions from the point of establishment. 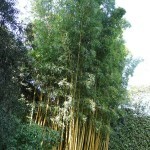 This bamboo is fast growing and will quickly spread via underground rhizomes. Despite containment efforts, the rhizomes of Phyllostachys aurea will often find their way out of confinement to infest nearby areas. The first step in preventative control of Phyllostachys aurea is to limit planting and removal of existing plants within the landscape. Care must be exercised to prevent seed spread and dispersal during the removal process. Cutting and mowing can be used on small infestations or where herbicides cannot be used. Cut plants as close to the ground as possible. Repeat several times throughout the growing season as plants resprout. Monitoring and re-treatment will be necessary for several growing seasons until the energy reserves in the rhizomes are exhausted. Foliar applications are most effective if canes are cut and herbicides applied to newly expanded leaves. Air temperature should be above 18°C (65°F) to ensure absorption of herbicides. Uses and display: Phyllostachys aurea is cultivated for its edible shoots in China; it has the sweetest taste of the genus. It has been widely planted as an ornamental in the Mediterranean and seems to be naturalizing there. This is a good companion species to grow in a woodland because the plants have shallow root systems that do not compete with deep tree roots. Grown for its screening abilities, Phyllostachys aurea provides visual as well as noise barriers. It is a prime choice for privacy screening or a bamboo fence. 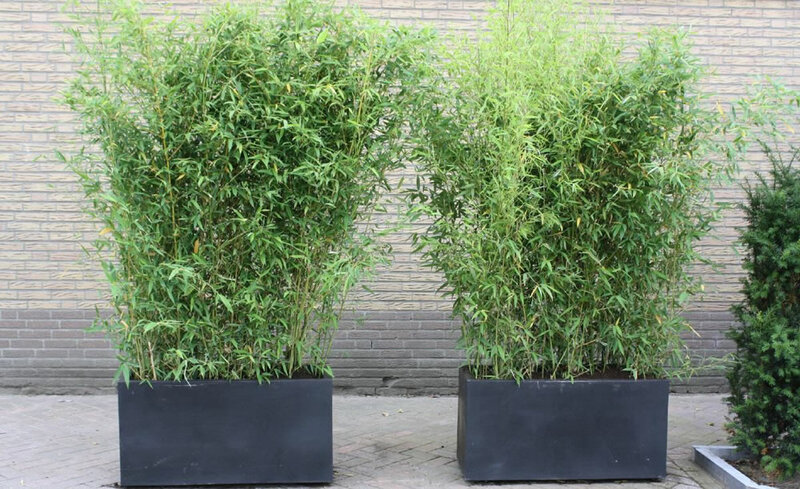 Also, this bamboo is suitable for planting in tubs or planter boxes: balconies, patios or indoor displays of bamboo create an exotic atmosphere.